We’re so thrilled that Larry Ellison himself announced and demoed Oracle’s Data Visualization Cloud Service (DVCS) in his keynote address today. This seems to be a validation of the title that Tim and I chose for our Oracle Press book Data Visualization for Business Intelligence 11g. 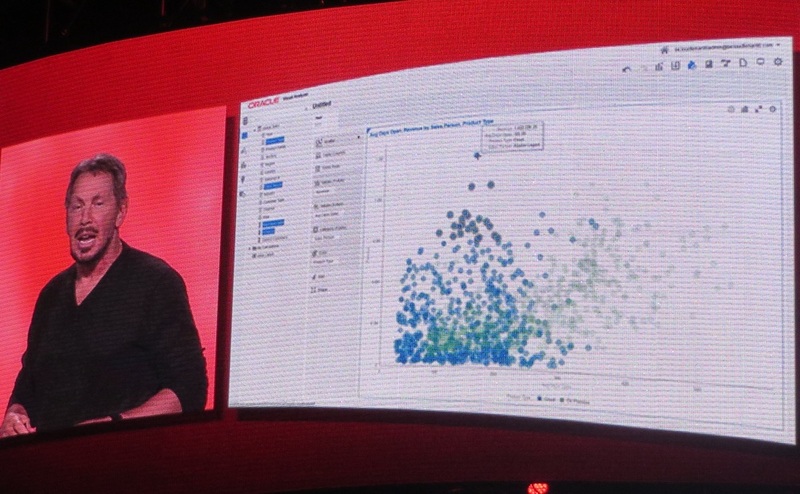 It is obvious that Data Visualization is an important new area of emphasis for Oracle. Look for more details here soon as we have a chance to share what has been under NDA until this week. There will be more information forthcoming as the week unfolds. You can find a video of Larry's address at https://www.oracle.com/openworld/on-demand/index.html - Larry's demo of DVCS is towards the end, close to time index 1:13:45. DVCS is Oracle’s cloud delivery of Visual Analyzer (VA), a new option to Oracle Business intelligence Enterprise Edition (OBIEE) 12c, released last Friday. VA is a central part of Business Intelligence Cloud Service (BICS). BICS delivers much (but not all) of the OBIEE functionality, with the standard Answers and Dashboard front end, but also the VA front end. DVCS delivers just the VA front end, leaving behind the rest of OBIEE. For customers that don’t want to have to deal with the intricacies (and don’t have a need for the benefits) of the OBIEE RPD mapping process, this could make a lot of sense. Just upload your Excel spreadsheets to DVCS and start visualizing the data yourself. Sure, if you have a couple spreadsheets, you’ll have to map how the columns relate (join) to each other. But this mapping exercise is designed to be done by end users, not IT professionals. So what does a DVCS workflow look like? We will update you as more information is officially released. You can also find the press release on Oracle's web site.